Here’s another fantastic outcome for the team at O’Shea Plumbing. When Wendy of Burwood East VIC rang O’Shea Plumbing it was in response to some bad news from her gas company. They had recently informed her she had water in her gas pipes. ‘Jarett’ (our Service Manager) promptly dispatched ‘Richard’ (our plumber) to investigate the situation. Richard pressure-tested the gas pipes on site, with the results affirming that there were indeed leaking and in a very poor condition overall. Quotes were issued to replace the old galvanised iron pipes with heavy duty copper alternatives, alongside press fittings (sourced from the Plumbers Supplies Co-op, Mitcham VIC). The pipes were ‘dug in’ underground. Where they were visible above the ground in a location that ran along a wall, they were securely clipped in place using strong metal clips and stainless steel screws (at a maximum interval of one metre). The new gas pipes were separately pressure-tested to a higher level. The pipes were connected with the appliances in Wendy’s home and were pressure-tested for a final time (as per AS/NZS5601 regulations). We are very pleased to find out that Wendy is back to enjoying cooking with her now safe-to-operate gas stove. She was also able to once again take hot showers thanks to her gas heating working 100 percent efficiently. It was obvious that Wendy felt relieved to have the peace-of-mind that comes from effective plumbing solutions, which is exactly the kind of result is what we like to see here at O’Shea Plumbing. Sitemap | Copyright ©O’Shea Plumbing 2019. All Rights Reserved. 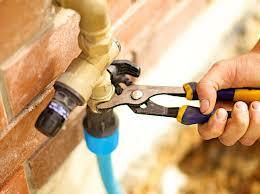 O’Shea Plumbing: 12 Windsor Avenue, Mount Waverley VIC 3149.